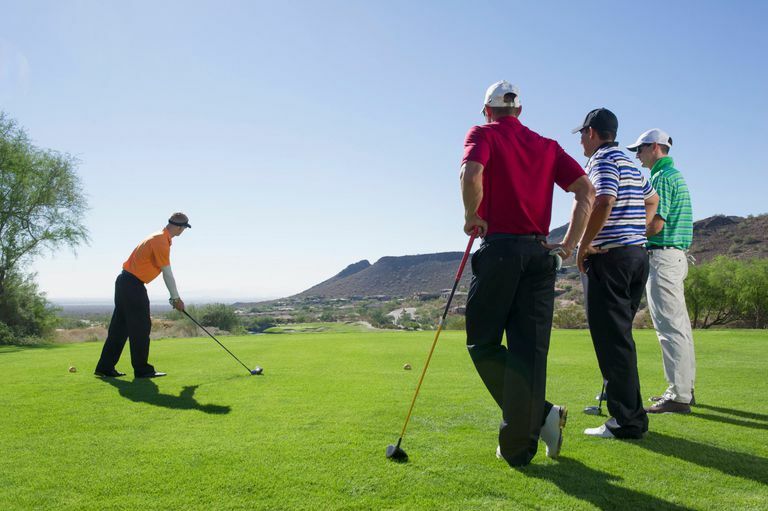 A Texas Scramble is a golf tournament format that is a basic scramble but with a slight twist. That twist is that each member of the 4-person scramble team is required to "contribute" at least four drives to the team during the round. A scramble and a Texas Scramble are mostly the same things. Let's start by reminding how a basic scramble works. Each member of a scramble team plays his or her own golf ball throughout. But with each stroke played, the four team members compare results and select the one best shot. The other team members move their balls to that location, and the next stroke is played from there. For example, all four golfers hit tee balls. Which of those shots is in the best position? Maybe Player C's ball is sitting pretty in the middle of the fairway, and long. So, the team selects that as its drive. Players A, B, and D pick up their balls and move them to the location of Player C's shot. Each team member then plays their second strokes from that location. This process continues until the ball is holed. And the process is the same in a Texas Scramble. So, what's the difference between a scramble and a Texas Scramble? It's the driving requirement. In a Texas Scramble each team member must contribute at least four drives throughout the round. What that means is that during the 18-hole round, the team must select at least four of Player A's drives as the team's drive, it must use at least four of Player B's drives as the team drive, and so on with Player C and Player D.
In a regular scramble, a great driver might have his tee ball used on every hole; a weak driver might not have a single one of his or her drives used by the team. But, a Texas Scramble eliminates that possibility and allows even the weakest driver on the team to get into the action. Of course, the driving requirement also puts the onus on each team member to come up with at least four decent drives for the team to use! The good news is that the team does not have to decide which player's drive it is using on a given hole until after each drive has been played. Maybe on the first hole, all four team members tee off and Player D—who is the weakest driver of the team—hits a decent drive. Not great, not the best of the team, but decent. Usable. Should the team use that drive? Well, you're going to have to use four of Player D's drives at some point during the round. This decent drive on the first hole might be a good place to use one of them. Those are the types of unique decisions that the Texas Scramble adds to the equation.